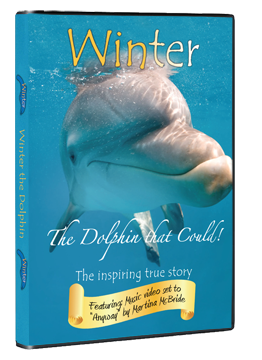 Winter the dolphin will be playing herself in "A Dolphin's Tale," which is scheduled to begin filming today. Most of the movie will be shot at the Clearwater Marine Aquarium. A robot double will be used in scenes that Winter cannot do. The movie will star Morgan Freeman, Harry Connick Jr. and Ashley Judd and tells the story of a boy who befriends an injured dolphin and helps her get an artificial tail. At three months old, Winter became tangled in a crab trap line near Cape Canaveral. She was rescued and brought to the CMA for rehab, but her injuries resulted in the loss of her entire tail and two vertebrae. To the surprise of marine experts, Winter adapted in spite of her serious injuries, and modified her swim pattern to accommodate her disability. Winter has also learned to eat fish on her own and is growing at a healthy rate. A human prosthetics company and a marine mammal veterinarian, developed a prosthetic tail for Winter. With the help trainers, she is being taught to use the prosthetic. Winter has been featured on the NBC Today Show, CNN and BBC, and is an inspiration to millions. Observing Winter playfully swim around her enclosure is truly a joy; she has overcome adversity by surviving her injury, and seems unaware of her impediment. Her story, however, is uncommon. Each year, countless dolphins become trapped in monofilament and crab trap lines and die. The Clearwater Super Boat National Championship Festival Race is returning next weekend after a successful event last year. As Super Boats equipped with F-16 jet canopies race just off the shore of Clearwater Beach while reaching extreme speeds of up to 200 mph during the Bright House 2010 Clearwater Super Boat National Championship Festival Race Sunday, October 3rd, the throngs of fans watching the spectacle of “NASCAR on water” will get a better view thanks to the improved sightline of a new race course. The new race course modifies last year’s course, and will not extend down to North Clearwater Beach, but will instead extend just beyond Pier 60. North Clearwater Beach will be omitted because sightlines of the race are not as good. The new race course will also give racing boats more room to get in and out of the racing area. While the race is free, VIP race viewing at the Hyatt Regency or the Hilton Clearwater Beach are available for purchase through the Clearwater Regional Chamber of Commerce and the Clearwater Beach Chamber of Commerce for $100. VIP Race Experience pass holders will be treated to a variety of VIP race experience activities as well, including VIP parties. All proceeds from the event benefit three local charities, The Clearwater Community Sailing Center, Sailability and the Make a Difference Fishing Tournament. The race will be followed by an awards ceremony in Coachman Park where the National Champions will be announced.